Paul Larson, founder and owner, began his insurance career in 1967 after graduation from Augustana College in Rock Island, Illinois. Over the last 42 years Paul has spent 10 years working on the company side of the business and 32 years on the agency side of the business. 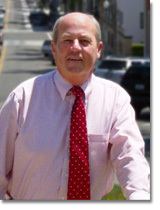 Paul was involved in the Personal Lines side and was manager of 2 insurance company branch offices. The agency side of the business has been spent producing and servicing commercial lines of business. Over the last 10 years, while developing his own agency, Paul has dealt almost exclusively in commercial lines of insurance with an eye toward apartments, condominiums, hotel/motel, restaurants and Main Street Retail Business. The Larson Agency represents more than a dozen of the largest and most respected insurance companies doing business in the U. S.
Paul has also been active in the following trade associations: Independent Insurance Agents Association of California, Independent Auto Dealers Association of California, National Asbestos Council, Building Industry Association and Ventura Trade Club.